Fox hunting with dogs is now illegal in England and Wales after a ban on the activity came into force overnight. The law faces a stiff test this weekend, with the Countryside Alliance saying many hunts will be out in force. Chief police officers spokesman Nigel Yeo said he expected most people would obey the law - by drag hunting or chasing foxes then shooting them. He said police would challenge the "one or two isolated hunts" which are threatening to break the law. The Attorney General, Lord Goldsmith, has so far issued no instructions to police on how they should deal with hunters who violate the law. He said he will consult the Director of Public Prosecutions and the police "in the near future" to decide what measures to take with regards to hunting prosecutions. He has rejected a "blanket policy" of not enforcing the ban until the House of Lords has considered its legality. Anti-hunting activists are celebrating the introduction of the ban. Hounds can be used to follow a scent and to flush out a fox and foxes can still be shot, or killed by birds of prey, after being tracked by a pair of hounds. 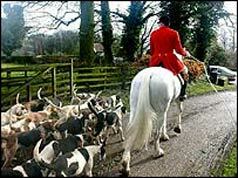 A year after the ban came into force hunt supporters continued to call for it to be repealed. The Countryside Alliance described the legislation as "derided, discredited and damaged beyond repair". Countryside Alliance chairman and Labour MP Kate Hoey warned that more foxes were being killed now than when hunting was legal. She told the Daily Telegraph newspaper that the law was broken inadvertently as dogs continued to kill foxes. But animal welfare groups and ministers praised the law, saying there were no loopholes or grey areas.